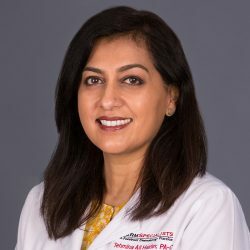 Tehmina Ali Haider is a certified physician assistant who specializes in the detection and treatment of rosacea, warts, skin cancer and more, as well as management of chronic skin conditions including psoriasis and eczema. As a provider, Tehmina takes the time to really get to know her patients and understand their health concerns. She values patient input when it comes to deciding an effective treatment plan and always seeks the best possible therapeutic option for them. Building a strong patient-provider relationship is key in successful treatment. Getting to know the patient and really listening to their concerns are the foundations for trust. Mutual respect is also an important and vital element in establishing stellar medical care. Along with keen medical knowledge, I feel these building blocks are one of the most crucial and important aspects of patient health care.